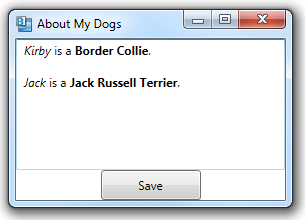 You can use the Save method of a TextRange object to save the contents of a RichTextBox control. In the example below, I enter some formatted text into a RichTextBox and then click the Save button. Here’s the code that does the save behavior. The resulting XAML file consists of an outer Section element that in turn contains multiple Paragraph elements.